Many years ago, while still a member of the laity (in fact, the diaconate wasn’t even on my radar), I had settled into my pew a few minutes early before Mass, finished a brief prayer, then read the readings for the day in the missal. As I turned the missal over to set it on the pew, the prayers on the back cover caught my attention. Lord Jesus Christ, take all my freedom, my memory, my understanding and my will. All that I have and cherish you have given me. Your love and your grace are wealth enough for me. Give me these, Lord Jesus, and I ask for nothing more. Amen. I was familiar with many of them, but this day, a prayer I’d never noticed popped out at me: The Dedication to Jesus. As I read the prayer, I felt it resonate deep within my heart… these words spoke to me in a way that no prayer ever had. When I’d finished reading, I noticed the attribution to St. Ignatius of Loyola. I took the missal home, memorized it over a period of a few months; it became my “go-to” prayer. A short, meaningful rededication of my faith and trust in Jesus. Ignatian spirituality has become a central theme in my prayer life since then. I was content… at peace in my acceptance of Christ the King. And then Sr. Faustina crossed my path. She hadn’t been canonized… her cause was certainly an active one, but I’d never encountered The Chaplet of The Divine Mercy. 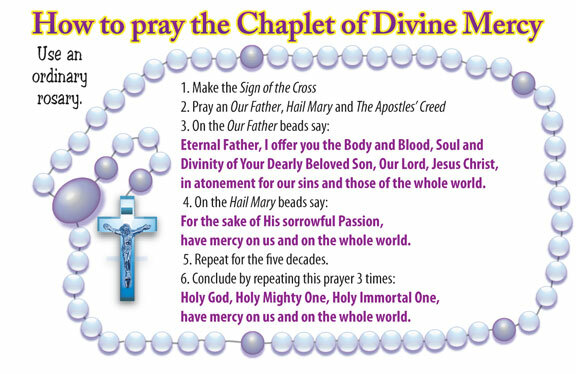 And, as you might expect, one aspect of the Chaplet clung to my heart just as tenaciously as the Ignatian Dedication: The Our Father bead prayer… coupled with the 10th Hail Mary bead prayer. For me, on this Divine Mercy Sunday, I am thankful for this prayer which has a singular place for me outside of the Chaplet: just before the reception of the Holy Eucharist, I offer all that Jesus is giving to me in His Holy Body & Blood to our Heavenly Father. It centers me… provides me with a powerful focus for reception of the sacrament. Most of all, year-round, I commemorate His Passion for salvation of the whole world. This entry was posted in evangelization, Men of Faith, Ministry, Reflections and tagged divine mercy, Eucharist, Ignatius of Loyola, jesus, prayer. Bookmark the permalink.